The chart breaks down the growing wealth gap via ownership of financial assets. 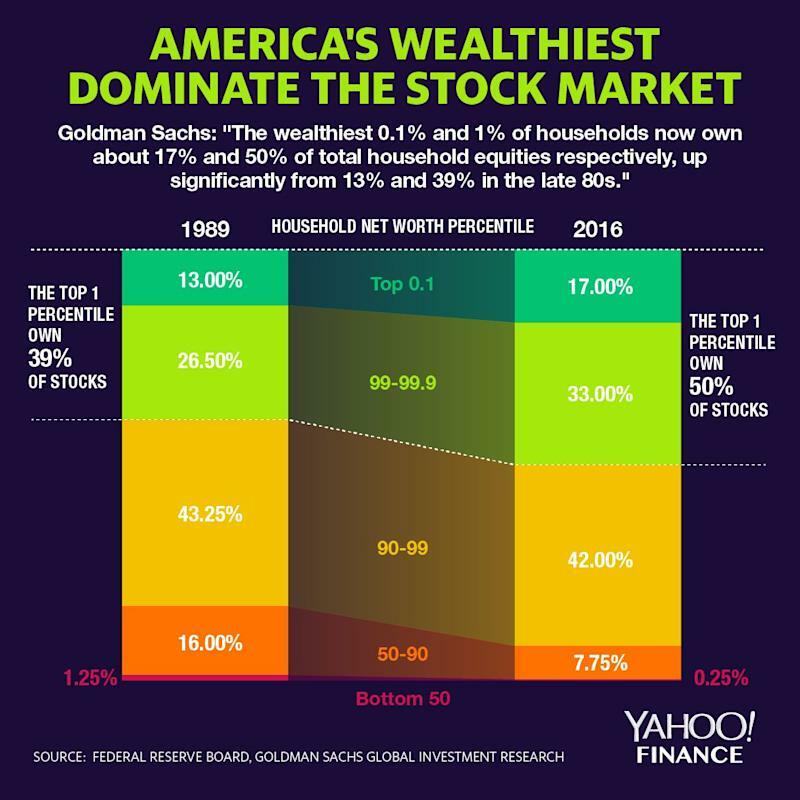 It illustrates the sharp decline in stock ownership share among the middle to upper-middle class citizens over the past few decades, while the richest Americans’ exposure to the market skyrocketed. Struyven explained that many believe that now when stocks sell off, there is a smaller decline in consumer spending because the richer people, whom by definition are insulated by more wealth, take the biggest hit. However, Struyven argued that it not the case. On the contrary, the higher concentration of stock ownership results in a bigger drag on consumer spending when the market sells off. “While the share of equities owned by the wealthiest households has risen over the last three decades, equity holdings have more than tripled as a share of disposable income at the aggregate level and have also risen substantially for middle and upper-middle wealth groups. Therefore, a 1% move in stock prices now has a much larger impact on wealth levels for most groups,” he explained. Additionally, Struyven said that the spending on luxury goods purchased by wealthy people is highly sensitive to stocks, specifically jewelry, watches, pleasure boats and pleasure aircrafts. “Our analysis suggests that the wealth effect from the stock market is unlikely to have fallen substantially over the past 30 years despite the rise in wealth inequality because equity holdings have risen sharply and because equity price moves still have a meaningful effect on the spending of wealthy households,” Struyven concluded.